Thanks for visiting my website. Please click Portfolio to browse my work. His name is Mr. Snowflake and I absolutely love this bird. 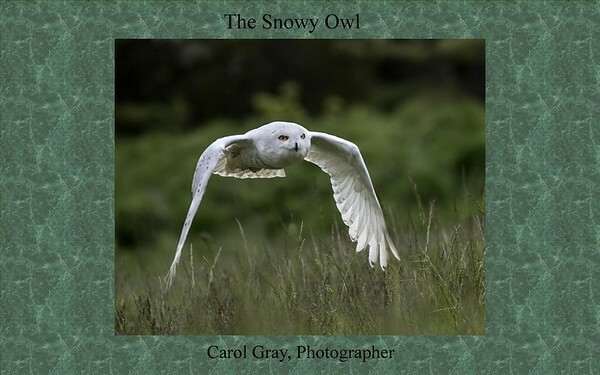 When you see a snowy owl, it's clear how the bird probably got its name: they're snow-white. Males are generally whiter than females. As males grow older, they get whiter. The females never become completely white—remaining brownish with darker markings. Most owls sleep during the day and hunt at night, but the snowy owl is active during the day, especially in the summertime. They tend to be most active at dawn and dusk. Snowy owl pairs usually mate for life. Female snowy owls lay from 3 to 11 eggs at a time, in a nest built on the ground. When there is plenty of food available, snowy owls tend to lay more eggs than when food is scarce. Babies are covered in soft white down when they hatch. As new feathers replace the down, the birds become light brown. The young leave the nest less than a month after they hatch. By the time they're about a month and a half old, the young owls can fly well, but their parents take care of them for another ten weeks or more. 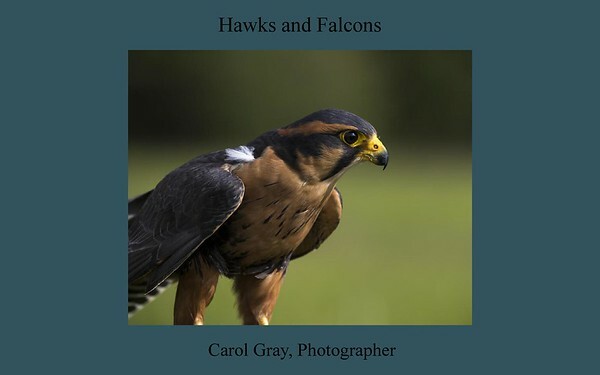 The photographs in this book were created at the Canadian Raptor Conservancy near Port Huron, Ontario, Canada. These, and many other wildlife photographs are available for sale on my website. I have been privileged to photograph this magnificent bird more than once at a wonderful place called the Canadian Raptor Conservancy. It is a privately owned facility on the north shore of Lake Erie and is not open to the public. You must sign up for a photo shoot in order to gain access to the premises. Only small groups of twelve or so are allowed at any one time. The owner, James Cowan, his sons and helpers, conduct 3 hour sessions for photographers wherein they fly several species of raptors under controlled conditions. Doesn’t that sound like an easy photo shoot? Well, it isn’t! The birds don’t always do what you want them to do! Our national bird is the only eagle unique to North America. At one time, the word "bald" meant "white," not hairless. And they are………..magnificent. And they are…………clowns. I have watched this Eagle waddling along behind his handler, squawking and complaining like a spoiled two year old. It is a comical sight and belies those piercing, steely, “eagle” eyes! 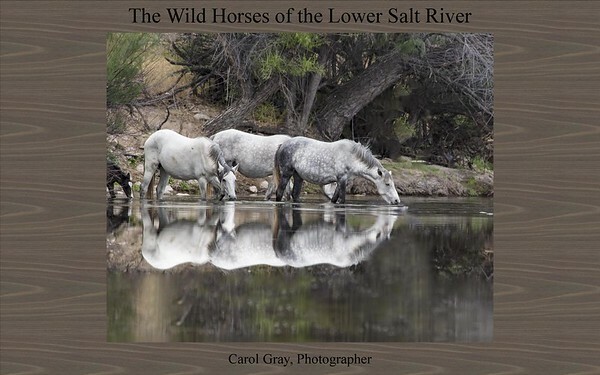 The Wild Horses of the Lower Salt River are a big tourist attraction in the Tonto National Forest near Mesa, Arizona. These wild horses were brought into the limelight when they were slated for roundup and removal in July of 2015. It didn’t happen, due largely in part to the efforts of a dedicated group of volunteers that has sworn to protect them. They are a favorite subject of photographers, a delight to tourists, and the icon of the wild, free spirit of the American West. They are wild, not tame, but they have become habituated to onlookers. This photographer has many times been able to sit quietly by and just enjoy their presence. The magnificent stallions each have their own band of mares and foals. During the Spring season there are many battles among the stallions for dominance. They steal each other’s mares and form new bands. All of the pictures in this book, and many more, are for sale in various formats on my website. Eurasian Eagle Owls have distinct individual vocalizations. 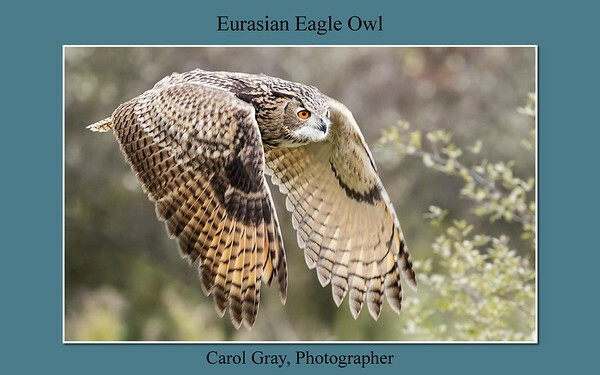 Every member of a Eurasian Eagle Owl population can be reliably identified by voice alone. As an apex predator, the Eurasian Eagle Owl has no natural predators. Even the Golden Eagle, with whom the Eagle Owl shares both range and food preferences, is seldom in direct conflict with the Owls, thanks to the birds hunting at different times of day (the Golden Eagle in daytime, the Eagle Owl at night). A lifespan of 20 years in the wild isn't uncommon for Eurasian Eagle Owls; birds in zoological care have been known to live as long as 60 years. Unlike the yellow-eyed Great Horned Owl, the Eurasian Eagle Owl has deep, brilliant orange eyes. 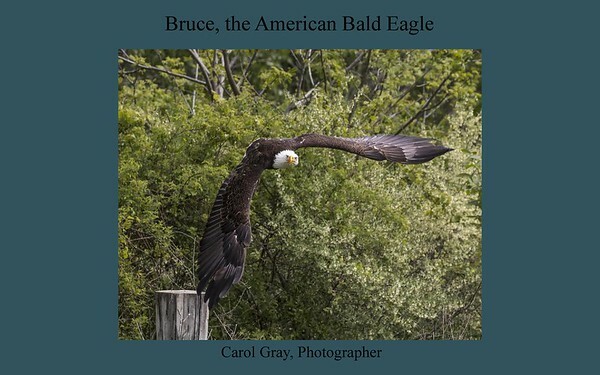 The photographs in this book were created at the Canadian Raptor Conservancy near Port Huron, Ontario, Canada, and at Bearizona, near Williams, Arizona. The photographs in all my books are available for sale in various formats on my website. Actually, the photographs in this book were created at several different locations, not just one Zoo. 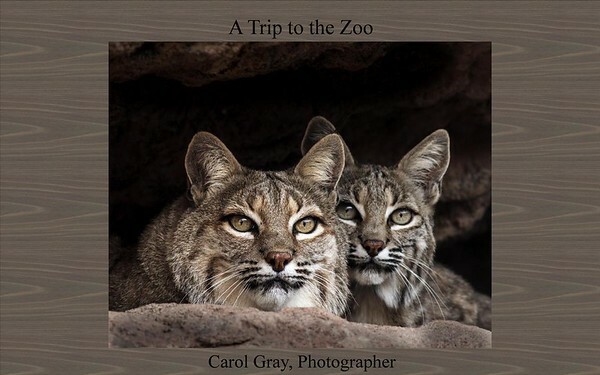 I have been privileged to photograph animals at the Arizona-Sonora Desert Museum near Tucson, at Bearizona near Williams, Arizona, at The World Wildlife Zoo and Aquarium in Phoenix, the Los Angeles Zoo, the Phoenix Zoo as well as several others. We have to teach our children to love and care for these animals and birds. It is my hope that a youngster will see one of my photographs, fall in love with the animal, and do everything that he or she can do to protect it in the wild. All of the photographs in this book are for sale in various formats on my website. 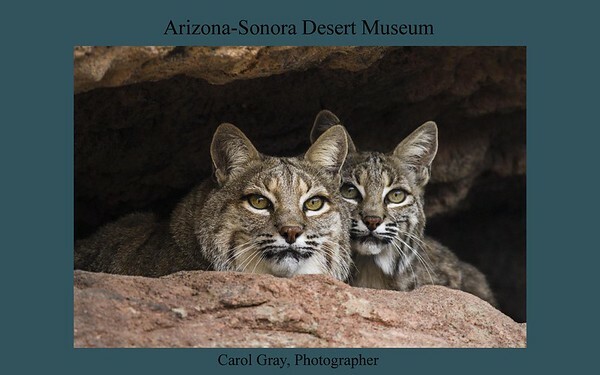 The mission of the Arizona-Sonora Desert Museum is to inspire people to live in harmony with the natural world by fostering love, appreciation, and understanding of the Sonoran Desert. Founded in 1952, the Arizona-Sonora Desert Museum is widely recognized throughout the world as a model institution for innovative presentation and interpretation of native plants and animals featured together in ecological exhibits. The Museum is regularly listed as one of the top ten zoological parks in the world due to its unique approach in interpreting the complete natural history of a single region (in our case this is the Sonoran Desert and adjacent ecosystems). This represents a significant achievement, as the Museum’s collections and size are smaller than many of its counterparts. Not a museum in the usual sense, it is an unparalleled composite of plant, animal, and geologic collections with the goal of making the Sonoran Desert accessible, understandable, and valued. The ASDM occupies a crucial niche in regional conservation and research efforts. Over its history, it has played a vital role in Mexican wolf recovery; protecting Islands in the Gulf of California and Tropical Deciduous Forest in southern Sonora, Mexico; direct salvage, augmentation, and reintroduction of at-risk reptiles and amphibians; developing a better understanding of venomous reptiles and their venoms; establishing regional coordination centers for invasive species management, as well as recognizing the importance of pollinators and documenting the impacts of climate change on mountain sky island biota. A number of prominent science and conservation leaders have stewarded the Museums research efforts over time, including Lew Walker, Richard Felger, Tom Van Devender, Gary Nabhan, and Richard Brusca. Today this work continues under the stewardship of several senior team members, including Debra Colodner, Craig Ivanyi and Stephane Poulin. This Photographer has spent many pleasant hours digitally capturing the many wonderful creatures that call ASDM home. Ghostly pale and strictly nocturnal, Barn Owls are silent predators of the night world. Lanky, with a whitish face, chest, and belly, and buffy upperparts, this owl roosts in hidden, quiet places during the day. By night, they hunt on buoyant wingbeats in open fields and meadows. You can find them by listening for their eerie, raspy calls, quite unlike the hoots of other owls. Despite a worldwide distribution, Barn Owls are declining in parts of their range due to habitat loss. These medium-sized owls have long, rounded wings and short tails, which combine with a buoyant, loping flight to give them a distinctive flight style. The legs are long and the head is smoothly rounded, without ear tufts. Barn Owls nest and roost in cavities, abandoned barns and other buildings, and dense trees. At night, Barn Owls hunt by flying low, back and forth over open habitats, searching for small rodents primarily by sound. Possibly their most distinctive feature is the sonar dish of their face that helps to concentrate the sound of a mouse scurrying in the grass. 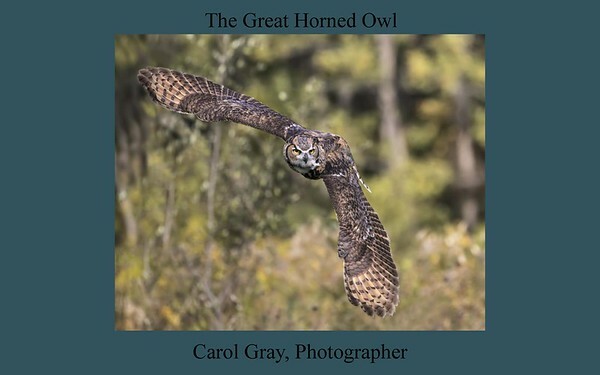 The photographs in this book were created at the Canadian Raptor conservancy near Port Huron, Ontario, Canada, and at the Arizona-Sonora Desert Museum near Tucson, Arizona. All photographs are for sale in various formats on my website. The great horned owl (Bubo virginianus) also known as the tiger owl (originally derived from early naturalists' description as the winged tiger or tiger of the air) or the hoot owl, is a large owl native to the Americas. The most powerful of the common owls, it is a stunning creature. Its big, yellow eyes are often compared to those of a cat, and are amplified by an orange facial disk outlined in black. The Great Horned Owl is a fierce hunter that prefers the sit-and-wait approach. Watching from a perch above, the owl will quietly swoop down on passing prey and seize its meal. The talons of this owl can extend to a size of 4x8 inches and can close down on its prey with the force of almost thirty pounds. Its wing feathers are comb-like with a soft fringe that helps reduces the sound of air rushing through them; as such the Great Horned Owl is more apt to glide than flap its wings. Such a maneuver makes it almost impossible for prey to hear it advance. The owls in this book were photographed at the Canadian Raptor Conservancy in Vittoria, Ontario, Canada, at the Arizona-Sonora Desert Museum, near Tucson, Arizona USA and also at Bearizona, near Williams, Arizona. A handsome hawk of the arid Southwest, Harris’s Hawk is a standout with bold markings of dark brown, chestnut red, and white, long yellow legs, and yellow markings on its face. The most social of North American raptors, these birds are often found in groups, cooperatively attending nests and hunting together as a team. When hunting, a group of hawks surround their prey, flush it for another to catch, or take turns chasing it. This hawk’s social nature and relative ease with humans has made it popular among falconers. 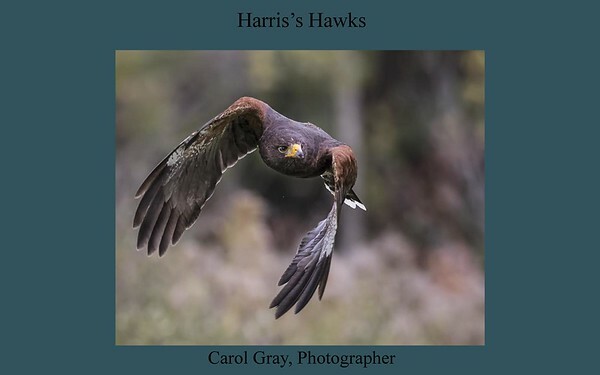 The Harris's Hawk nests in social units that vary from an adult pair, to as many as seven individuals, including both adults and juveniles.. Cooperatively hunting groups of Harris's Hawks are more successful at capturing prey than individuals hunting alone. Hawks with more than two members in their group have higher survival rates. The Hawks in this book were photographed at the Arizona-Sonora Desert Museum near Tucson, Arizona and at the Canadian Raptor Conservancy in Vittoria, Ontario, Canada. All photographs are available for sale, in various formats, on my website. Falcons are smaller and faster. For example, the Peregrine Falcon is not very strong, but can reach incredible speeds that allow them to grab a small bird or mammal for lunch (such as a pigeon or rabbit). On the contrary, the Red Tailed Hawk is much more powerful and utilizes its talons to take out small mammals, other birds, fish, and the like. With regard to "falcons are a type of hawk" - Falcons (Falconidae) and hawks (Accipitridae) are genetically unrelated-- while hawks are related to eagles, falcons are more closely related to parrots and songbirds. Both are adapted for different prey and hunting styles. Falcons are primarily mid-air hunters taking out quail, small ducks and pigeons although they will not turn down a rodent lunch. Hawks (such as the red tailed) are primarily ground hunters focusing more on fish, rodents and a variety of ground mammals. Hawks will take out other birds but are better adapted for ground prey. The most amazing difference is the the falcon's speed. Falcons have been recorded as diving in excess of 200 mph! 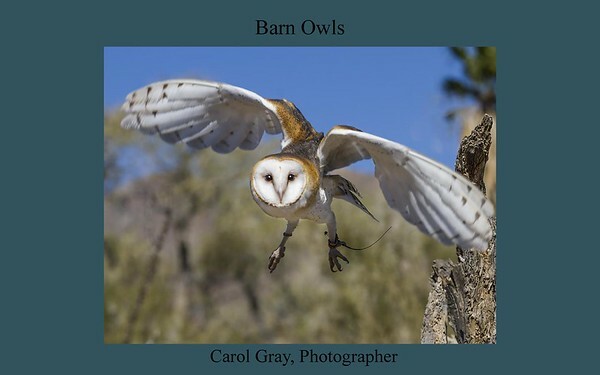 The birds in this book were photographed at the Arizona-Sonora Desert Museum near Tucson Arizona and at the Canadian Raptor Conservancy near Port Huron, Ontario, Canada. All pictures are for sale in various formats on my website. 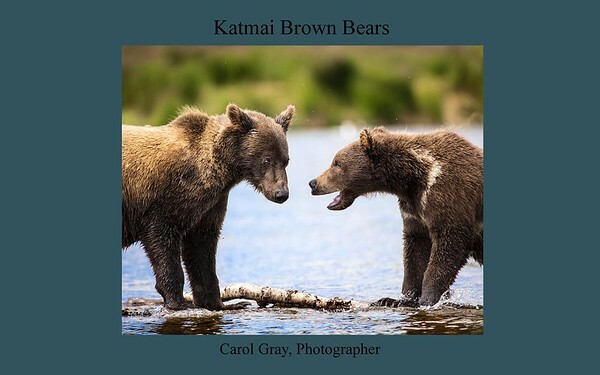 Katmai National Park sprawls over four million acres in southern Alaska. Brooks Falls is one of the main attractions for about 2000 reasons: the approximate number of Coastal Brown Bears that live permanently in the Park. Brooks Camp is only accessible by float plane, which from the town of King Salmon, is a delightful twenty-five minute, very noisy flight across the watery tundra. The best time to go is during the salmon run. Of course, everyone has the same idea so the viewing areas are really crowded during the run in the summer months. After your Bear orientation by one of the Rangers, and then a 30 minute hike to the viewing platform, you will be rewarded with sightings such as those examples displayed in this book. All of the pictures in this book are for sale, in various formats, on my website. 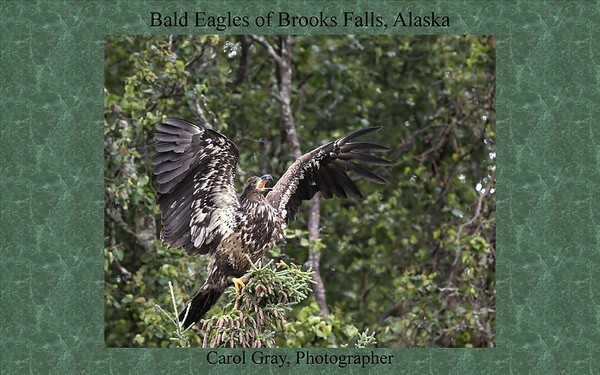 In addition to the Katmai Brown Bears catching salmon at Brooks Falls, majestic Bald Eagles abound in the same area. They soar and dive and try to fend off the many sea gulls that frequently dive-bomb them. The gulls are after the scraps that the Bears and the Eagles leave behind. All in all it is a very balanced system. Everybody wins. The Bears make the big showy, salmon catches and they gorge on the fatty parts of the fish. The Eagles swoop in and pick up the big scraps and carry them off to a rock or a perch to devour, or they take the leftovers to their nest for their chicks. The Gulls come last and pick the rocks and the shoreline to get the remaining tidbits. Any of various cud-chewing hoofed mammals having a stomach divided into four (occasionally three) compartments. These are hoofed mammals that chew a cud. 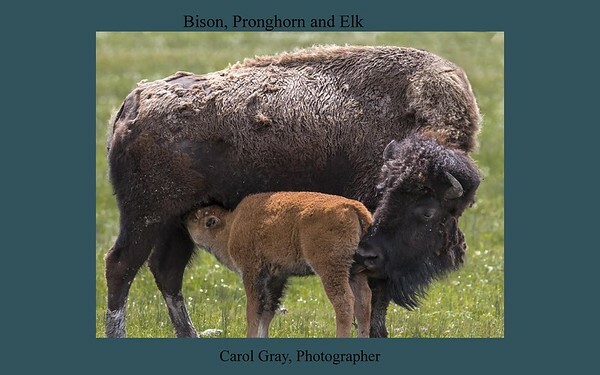 They include Bison, Pronghorn Antelope and Elk. They roam the grasslands and plains and travel in herds. Yellowstone Park, where these pictures were created, is the only place that Bison have lived continuously since prehistoric times. They never shut up. As they graze, which they do constantly, you can hear them grumbling in a very low tone, always in communication with each other. The Pronghorn Antelope is the 2nd fastest land mammal on the planet, second only to the Cheetah, and can reach speeds of 53 mph. They can eat plants that are toxic to domestic animals. They are strikingly beautiful. Elk are also called Wapiti and are the largest species of deer. They are active mostly at dawn and at dusk. They shed their antlers every spring and grow them back again during the summer in time for the Fall rut. All of the pictures in this book are available in many and varied formats and are ready for you to purchase on my website.